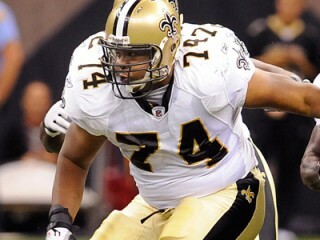 Jermon Bushrod (born August 19, 1984 in King George, Virginia) is an American football offensive tackle for the New Orleans Saints in the National Football League. He played college football at Towson University. – Re-signed (RFA), 4/13/10; Signed to a three-year contract, 7/20/07; Drafted by the Saints in the fourth round (125th overall) of the 2007 NFL Draft. Played in 15 games, making the first 14 starts of his career at left tackle. vs. Detroit (9/13): Made his first career start, opening at LT and helped the team to a 45-27 victory with 515 yards of total offense and zero sacks allowed. at Philadelphia (9/20): Started at LT in the 48-22 win. at Buffalo (9/27): Started at LT before leaving the game with an ankle injury. vs. NY Jets (10/4): Inactive with knee and ankle injuries. vs. NY Giants (10/18): Started at LT and helped the offense to put up 48 points with 493 total yards and kept QB Drew Brees without being sacked against the previously top-ranked Giants defense. at Miami (10/25): Was the starting LT in the win. vs. Atlanta (11/2): Started at LT in the victory. vs. Carolina (11/8): Started at LT and helped hold All-Pro DE Julius Peppers without a sack in the win. at St. Louis (11/15): Started at LT and helped the team post 203 rushing yards. at Tampa Bay (11/22): Played in a rotation at left tackle and helped keep Drew Brees from being sacked in the win. vs. New England (11/30): Started at left tackle and helped the team to post 480 yards of offense in the 38-17 victory. at Washington (12/6): Was the starting left tackle in the overtime victory. Also made a tackle on special teams when he tackled Redskins CB Fred Smoot as he attempted to run back a field goal attempt at the end of regulation. at Atlanta( 12/13): Started at LT and helped keep Drew Brees from being sacked in the win. vs. Dallas (12/19): Started at left tackle. vs. Tampa Bay (12/27): Started at LT. at Carolina (1/3): Started at left tackle. vs. Arizona (1/16 – Divisional Playoff): Started at left tackle and helped keep Drew Brees sack-free in the win. vs. Minnesota (1/24 – NFC Championship Game): Started at LT and held his own against All-Pro DE Jared Allen in the victory. vs. Indianapolis (2/7 – Super Bowl XLIV): Started at left tackle in the Super Bowl win....2008 – Inactive for 12 games, dressed but did not play in two and appeared in two contests on special teams, blocking on the kick return units. 2007 – Inactive for 14 games as a rookie, played in one, and dressed but did not see action in another. Made NFL debut at Houston, Nov. 18, serving as a blocker on the kickoff return unit. – A four-year starter at Towson. Voted All-Atlantic 10 selection at left tackle in 2006 and excelled in both pass protection and run-blocking. Finished career with a streak of 38 consecutive starts. Earned third-team all-league honors as a junior and recorded nine TD-resulting blocks. Posted 72 knockdown blocks and garnered third-team All-Atlantic 10 honors as a sophomore, his first full season as a starter. Started five games in 2003 after redshirting in 2002. PERSONAL – Sports management major...Attended King George (Va.) HS, where he was a standout in football, basketball and baseball. Honorable mention all-state selection at offensive tackle. Has worked as a substitute teacher and done community service work at various NAACP events. Resides in King George, Va.
View the full website biography of Jermon Bushrod.